Contact Us to arrange a private course for your group. This course is designed for people with little or no prior medical training. It is designed for weekend adventurers, camp staff and outdoor enthusiasts. Learn how to care for yourself and others on your next adventures!! 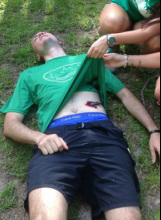 Wilderness First Aid (WFA) is a 16 hour course designed for outdoor enthusiast. Basic first aid skills are covered to keep you and your friends and family safe in outdoor environments. We emphasize scenario based learning for a hands on learning experience. The curriculum is developed through AdventureMed and is licensed through University of Utah. "Learn the skills to prevent medical problems and treat common illness and injuries in remote settings or in your own backyard"
This will be a 16 hour certification course.